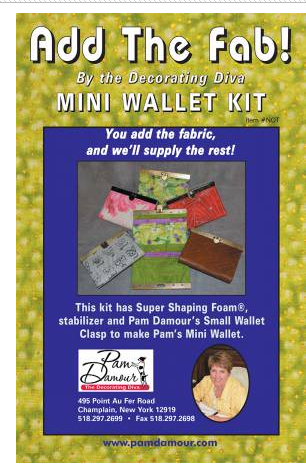 DESCRIPTION This kit has everything you need to make the Mini Wallet from The Decorating Diva. Included is the fusible foam, stabilizer and wallet frame. All you need to do is add the fabric, thus the name. The pattern is not included, but can be found in the book Hold Everything and with the Cell Phone Template/Pattern.